3-331 GENERAL. This section provides information for use by the inspector during surveillance of balloon operations, and includes safety recommendations from the Balloon Federation of America (BFA). This section also provides information on unmanned free balloons	and differentiates between moored (unmanned) balloon operations and tethered (manned) balloon operations. Guidance concerning balloon competitions and meets is located in Volume 3, Chapter 6, Section 1, paragraph 3-152, Balloon Meets and Competitions. A. Regulatory Compliance. Balloons are a class of the lighter-than-air category of aircraft, and must be operated and maintained under Title 14 of the Code of Federal Regulations (14 CFR) parts 91 and 43. Balloon pilots must be certificated under 14 CFR part 61. The provisions of 14 CFR part 119, § 119.1(e)(5) exempt balloon sightseeing flights from 14 CFR part 135; these flights are conducted under part 91, General Operating and Flight Rules. 1) When surface winds exceed 7 knots, the potential hazards with balloon launch procedures increase exponentially with the increase of wind speed. 2) Balloon pilots should consider existing and forecast wind directions and velocities when selecting launch sites. If there are trees or obstructions downwind, the pilot should ensure that there are adequate distances to permit the balloon to climb above them. NOTE: Extreme caution (including termination of flight) must be used any time balloon operations are contemplated close to or upwind of high-tension wires. 3) Before takeoff, the pilot should ensure that the ground crew is thoroughly briefed on their duties during the planned fight. 4) Under part 91, § 91.119(b) and (c), balloon pilots must select appropriate launch and landing sites. Under light or calm wind conditions, these sites might be quite small. 5) The pilot should ensure that existing and forecast weather conditions are suitable for the planned operations. 6) The pilot should always be aware of the possibility of becoming becalmed (unable to drift because of lack of wind) over areas offering limited appropriate landing sites. If groundspeed slows, the pilot should consider landing before drifting over those areas. 7) Balloon pilots must be aware of the potential hazards of operating in areas of wind shear. These potential hazards include abrupt changes in groundspeed and/or direction during takeoff or landing; changes in the shape, size, and flight characteristics; and even closure of the mouth of the balloon in flight when shear exceeds 15 knots. Balloon pilots must take precautions to avoid wake turbulence and rotor wash of large aircraft. C. Minimum Safe Altitudes. Section 91.119(a), (b), and (c) applies to all free balloon operations. Except when necessary for takeoff or landing, a balloon may not be operated below an altitude that would permit an emergency landing without undue hazard to persons or property on the surface. D. Powered Civil Aircraft Equipment and Instrument Requirements. Under § 91.25, balloons are not considered powered aircraft. As used in the 14 CFR, the term “powered” consistently refers to aircraft with horizontal propulsion systems. Minimum equipment for hot air and gas balloons is identified in 14 CFR part 31, § 31.85. 3-332 MOORED BALLOONS. A moored balloon is a balloon that is secured to the earth by several mooring lines and does not carry a person. 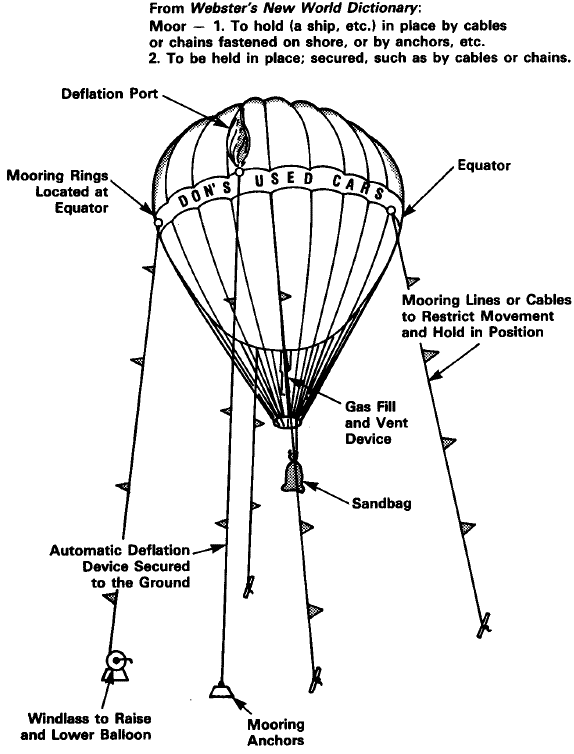 The mooring lines prevent the balloon from swinging in the wind and keep it in a stationary position (see Figure 3-61, Moored Balloon). Moored balloon operations must be conducted in accordance with 14 CFR part 101. 1) There are no airworthiness standards for moored balloons operated under part 101 because carriage of passengers aloft was not intended. 2) Part 101 was not intended to apply to hot air or gas balloons (aircraft) occupied by passengers and crew and operated under part 91. Part 101, § 101.19 requires an automatic rapid deflation device on a moored balloon to protect airspace users from a moored balloon that separates from its moorings. An automatic deflation device operates independently of any human input. It must be designed to deflate the envelope if a balloon separates from the mooring. This requirement does not apply to manned balloon operations under part 91. 3) Part 101 subpart B contains the regulatory requirements for operation of a moored balloon. Issuance of any Certificate of Waiver or Authorization (COA) for the operation of a moored balloon is accomplished by Airspace Services (AJV). Flight Standards (AFS) offices may not issue a COA for part 101 operations. AFS employees that are contacted by a group or individual that wishes to conduct moored balloon operations under a COA must refer that group or individual to the appropriate Regional Airspace Specialist. B. Bungee Jumping. Tethered balloons used for the purpose of bungee jumping must meet all appropriate operational requirements of parts 61 and 91, must be manufactured in accordance with part 31, and must be maintained in accordance with 14 CFR parts 21, 43, and 91. Balloons that have been modified must have an appropriate Supplemental Type Certificate (STC) or field approval (Federal Aviation Administration (FAA) Form 337, Major Repair and Alteration) for the modifications. A. Free and Tethered Flight Considerations. If a balloon is considered an aircraft under one circumstance (such as free flight), it must still be considered an aircraft under other operating circumstances, including tethered flight. Tethered balloons are considered aircraft, and must be operated in compliance with all construction, certification, airworthiness, registration, and operating regulations applicable to aircraft. 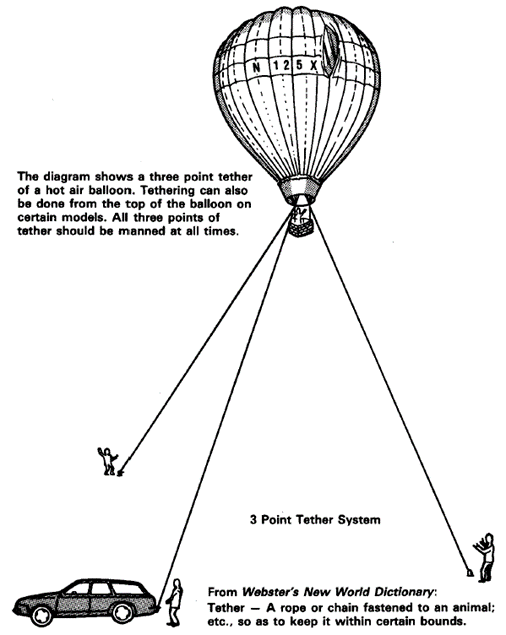 1) When not in total free flight, a tethered balloon is limited by tether lines (normally three) that allow the balloon a radius of movement around the points of anchor (see Figure 3-62, Tethered Balloon). The size of this radius of action depends on the length of the tethers and the strength of the wind. 2) Operation of a manned, tethered balloon requires essentially the same vertical control skills as those required to operate a free balloon. 3) A balloon on long tethers (over 150 feet) may create a collision hazard between other aircraft and the tether lines. For night operations, consideration should be given to providing a lighted tether. Where local air traffic control (ATC) service is available, the operator should advise the ATC facility of the presence of the tether lines and balloon. 4) When a balloon is tethered in Class D airspace, the operator must advise the appropriate ATC facility of the balloon operation. 5) Hot air or gas balloons certificated as aircraft but operated on a tether are not considered moored balloons. Part 101 does not apply to their operation. 3-334 UNMANNED FREE BALLOONS. Part 101 subpart D contains the regulatory requirements for operation of an unmanned free balloon. Issuance of any COA for the operation of an unmanned free balloon is accomplished by AJV. AFS offices may not issue a COA for part 101 operations. AFS employees that are contacted by a group or individual that wishes to conduct unmanned free balloon operations must refer that group or individual to the appropriate Regional Airspace Specialist. 3-335 GAS BALLOONS. Gas balloons are regulated in the same manner as hot air balloons. Examiners and inspectors who conduct initial practical tests for free balloon (gas) pilots should use the applicable portions of the free balloon practical test standards ( PTS), as noted in the introduction to the PTS. NOTE: This operation is subject to 14 CFR part 101. NOTE: This aircraft’s operation is subject to 14 CFR part 61, 91, or 43, as appropriate. RESERVED. Paragraphs 3-336 through 3-350.